Future Energy Systems Principal Investigator Rick Chalaturnyk leads a tour of CFREF administrators. In an elevator climbing from sub-level two in the University of Alberta’s Natural Resources Engineering Facility last Thursday, the talk amongst the tour group was about 3D printing. Future Energy Systems Principal Investigator Rick Chalaturnyk had just demonstrated how his team uses that technology to produce identical rocks, allowing researchers to test how the capstones of reservoirs deep underground might react if carbon dioxide was pumped into them instead of spewed into the atmosphere. By 3D printing rocks with specific characteristics, Chalaturnyk’s team can see how certain types of naturally-occurring faults in a potential reservoir might respond to gigatons of CO2 under different temperatures and pressures. “The way we do this isn’t really done anywhere else,” he explained as he handed around sample rock structures printed for the literally-groundbreaking research. His audience during the tour was not surprised by the novelty of the work, nor were they unfamiliar with doing unique research; they were leading administrators from programs funded under the Government of Canada’s Canada First Research Excellence Fund, or CFREF. On the elevator ride up from Chalaturnyk’s GeoPrint facility, they were already making comparisons between his methods and those they were familiar with at home. That makes sense: BrainsCAN researchers are examining the brain in new ways, changing how neurological diseases are understood, diagnosed, and treated. Like Chalaturnyk, they are using the latest technology to support new methods for discovery. 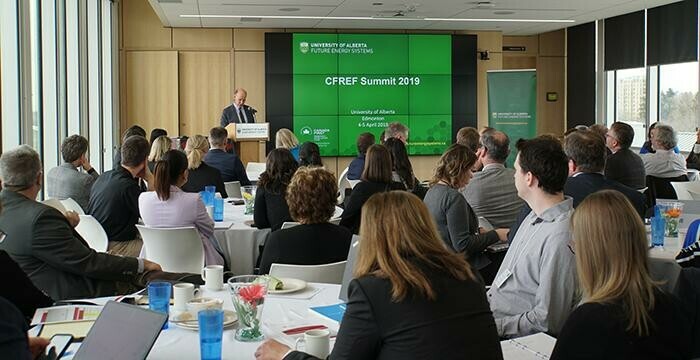 Also like Chalaturnyk, their program’s administrators were among 67 people participating in the 2019 CFREF Summit, hosted by Future Energy Systems at the University of Alberta. In two waves between 2015 and 2016, the Government of Canada committed more than $1 billion to fund eighteen CFREF projects that share a common mission: “turn key strengths into world-leading capabilities.” Though that mission is shared, the paths to achieving it are as distinct as each initiative. The program features an abundance of research diversity. Health and medicine are the primary focus of five initiatives: the University of Toronto’s Medicine By Design addresses regenerative medicine and cell therapy, Polytechnique Montreal’s Institut TransMedTech uses a living lab to investigate degenerative and musculoskeletal diseases as well as cancer, VISTA at York University focuses on vision, and McGill University’s Healthy Brains for Healthy Lives joins BrainsCAN in cutting-edge neuroscience research. Potential new quantum technologies and materials are being explored collaboratively by Institut Quantique at Université de Sherbrooke, along with Transformative Quantum Technologies at the University of Waterloo and the University of British Columbia’s Stewart Blusson Quantum Matter Institute. Queen’s University hosts the Arthur B. McDonald Canadian Astroparticle Physics Research Institute, which is building a network of particle physicists to position Canada on the world stage. Based at Université de Montreal, the Institute for Data Valorization –– IVADO –– is a research-industry partnership creating a global nexus for artificial intelligence, machine learning, and deep data innovation. The remaining CFREF programs engage with Canadian and global resources. Understanding the impact of water on our lives is the focus of the University of Saskatchewan-led Global Water Futures, as well as the Ocean Frontier Institute, a joint program operated by Dalhousie University, Memorial University of Newfoundland, and the University of Prince Edward Island. Université Laval launched Sentinel North to bring its wide-ranging research and training expertise to the northern environment, while Laurentian University’s Metal Earth focuses on developing better understandings of ore systems –– resources crucial to the Canadian and global economies. Food security and sustainability is the focus of two programs: the University of Saskatchewan’s Plant Phenotyping and Imaging Resource Centre (P2IRC –– no relation to Future Energy Systems’ own PIRC), and the University of Guelph’s program Food From Thought. The University of Calgary’s Global Research Initiative in Sustainable Low-Carbon Unconventional Resources and Future Energy Systems at the University of Alberta both investigate energy –– how to reduce the impacts of current technologies, the development of renewable energy and storage technologies for the near future, and the environmental, economic, and social questions related to the coming energy transition. Collectively, these programs represent some of the finest research currently being undertaken in Canada, and despite significant differences in subject and scope, they all share a key priority: preparing for the future. Within the research community, the term ‘Highly Qualified Personnel’ –– HQP –– generally refers to trainees including students, post-doctoral fellows, and technicians. These people are near the start of their careers, and collectively represent one of post-secondary research’s most important and lasting contributions to society. In Future Energy Systems, the breadth of the research area makes it realistic to set the objective of training 1,000 HQP by 2023. For other programs, where questions are highly specialized or require lengthy and costly experiments, targets can be different –– perhaps dozens of students. No matter the number, each CFREF program seeks to train the very best minds in Canada to be world-leaders in their fields, so they can continue making an impact long after the CFREF program concludes. This collective focus on HQP presents an opportunity for innovation: connecting young researchers with peers outside their fields can spark innovative collaborations that fundamentally change research trajectories. During the Summit, Future Energy Systems Director Anne Naeth highlighted a successful example: when HQP from the initiative’s solar and carbon capture themes began exchanging knowledge about machine learning techniques, a lunch-and-learn and subsequent workshops spread their methods to work on biofuels, land reclamation, and even medical research abroad. Similar stories of transdisciplinary thinking can be found throughout the CFREF initiatives. In one recent example, Medicine By Design investigators working to grow liver cells in support of research and transplants teamed up with a mechanical engineering team to experiment with the bioprinting of crucial, theoretically-transplantable bile ducts. When such innovations can be found by crossing disciplines within a single institution, the potential value of connections across diverse CFREF programs seems vast. Initiatives working in similar spaces –– medicine, quantum, and energy –– are already finding ways to collaborate on research. As a result of last week’s summit, CFREF administrative teams across Canada will work together in the coming months to find new methods for sharing stories beyond existing partnerships, with a particular emphasis on promoting HQP. For Future Energy Systems the process begins with the May 2019 monthly newsletter, which will include a new section highlighting research stories for other CFREF initiatives. 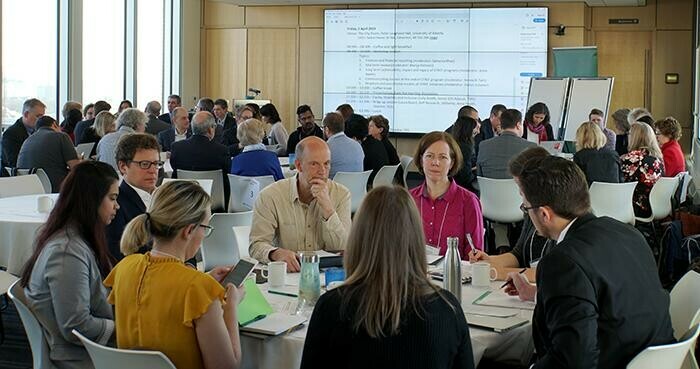 By the time the next Summit convenes in 2020, researchers working in vastly different fields at institutions across Canada will have had the chance to learn a little more about what their peers are up to –– and how they might collectively leverage their key strengths into global excellence. Though no matter how familiar the programs become with each other in the coming year, the elevator ride after the next Summit’s lab tour will undoubtedly trigger more excited conversation. The Canada First Research Excellence Fund puts excellence on display. Whether that means printing rocks, brains, livers, a paper announcing the first viable quantum computer, or something else entirely, it’s bound to be impressive.